The Crazyfly Sensei is one tough 2-line trainer kite. The Crazyfly comes ready to fly and is easy to handle. 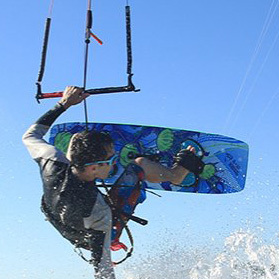 It's a fantastic trainer kite for learning and mastering foundational kiting skills. Two different sizes: 2m and 3m. Comes complete with kite, control bar and fly lines. The Sensei makes a great starter kite for jumping on a landboard in a wide open park or taking a ride on a longboard on a large parking lot. The Kitemare Advantage: Our NO BULL Guarantee! Our Exclusive NO BULL Guarantee puts some stoke behind every purchase. NO ONE DOES WHAT WE DO!!! 60 Days for Unopened Returns, no questions asked!